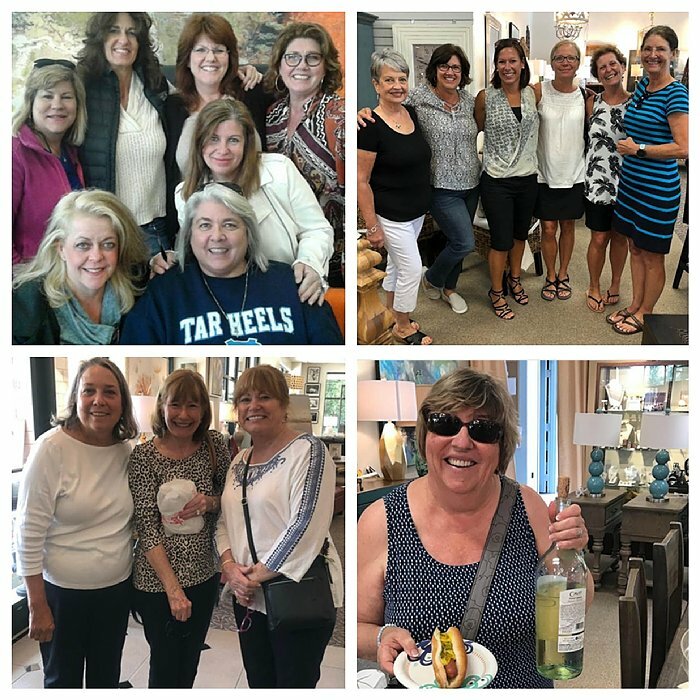 Because so many of our customers bring their friends & family to visit the store and hang out with us! We will have coffee, cookies, vino and BARGAINS for you all weekend long. On with the show! Ivory sectional just in…$1,295, 60x123x95″. Vibrant, large scale hand embellished abstract, $525, 62″ square. Made Goods ‘Cara’ oval coffee table retails $2,450, our price $395. 47x24x18″h. Red crackle genuine porcelain lamp on lucite base, $165, 30″h. Shabby-chic white dining table & 6 chairs just $495. 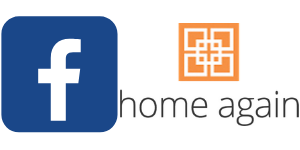 72x42x29″ includes 12″ leaf. Large shorebird companions, $325 ea, 40×60″. Nautical turquoise lamps, $125 ea, 29″h. Hand embellished beach art, $225, 40×30. Porcelain pots $75 & $95. These custom chaise lounges in spa blue and gold silk by high end maker Swaim retailed for $7,000, our price $995 ea. Immaculate condition, 66x29x35″h. Gold and stone Modern History side tables, retail $999 ea, our price, two available $425 ea. 20.5×23.5×23.5″h. White cabinet with baskets, $325, 44x9x35″h. Blue/green fish lamps, $125 ea, 27″h. 31″ seagrass mirror, $85. 24″ counter stools, $125 ea. We get the BEST art… (clockwise) Framed beach art, $195,53.5×29.5. Umbrella canvas, $145, 30×40. Coastal watercolor, $195, 40×40. 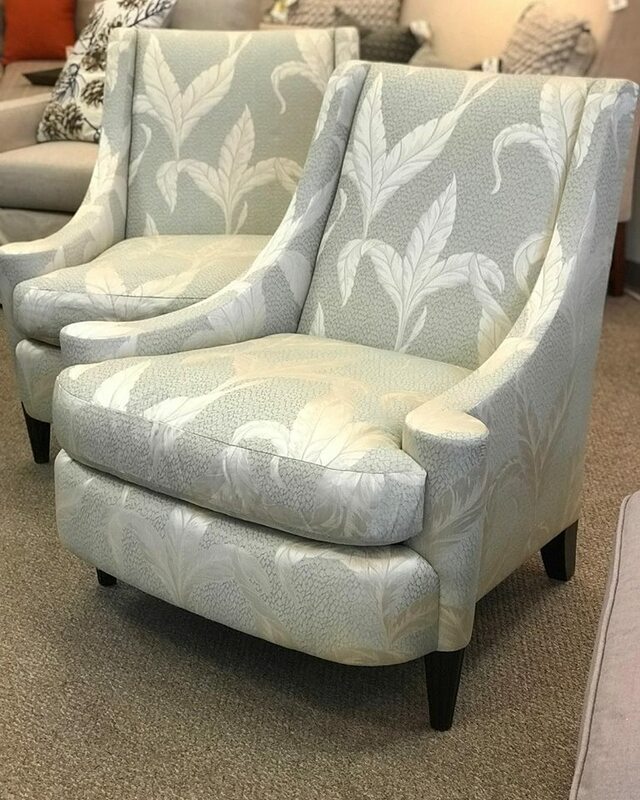 Another HIGH END SCORE…lovely soft blue floral arm chairs by Barbara Barry for BAKER $395 ea. 30″w. Like new. Easy & affordable stocking stuffers that they will actually like! Just $4-$10. ADORBS indoor-outdoor Christmas pillows, $38-$48 ea. We love when a vignette pulls together…Braxton Culler queen sleeper sofa, $895, 78x37x31”h. Textured abstract companions, $225 ea, 41.5×31. 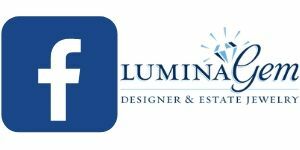 Aqua lamps, $125 ea, 33″h. These won’t last…navy trellis print chairs, $395 ea, 30x33x37.5″h. Beautiful framed sailboat art on consignment, $175, 45×37. Chinoiserie fans…come snap up this Hekman console table in deep red…it retails for $749, our price brand new, $495, 56x18x34″h. Stools for everyone! Clockwise: Gold 18.5″h stools, $35 ea, 4 available. 30″h banana leaf stools, $95 ea, 2 available. White patina 24″ swivel counter stools, $125 ea, 6 available. 30″ soft aqua stools, $125 ea, 6 available. All sold in pairs only. 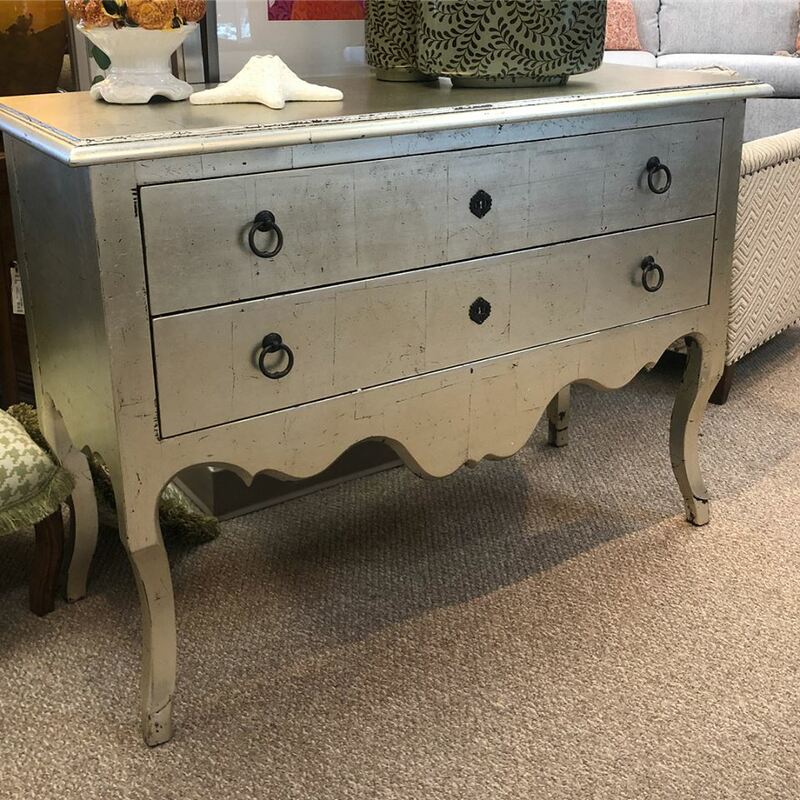 We ADORE this CLASSIC chest…retails online for $1249, our price $795. And it’s brand new. 44x22x36h. Natural with grey-wash.
We are BIG fans of this rustic cabinet, $525, 50x18x35″h. Geometric print accent chairs in chocolate and ivory, $395 ea, 28x31x36″h. Landscape art, $75, 48×32. Gold buffet lamps, $75 ea, 32.5″h. (L-R) A fab wine console that holds up to 27 bottles for $295. 40x14x35.5″h. Stunning champagne gold distressed chest. Retails for $798, our price $495. 45x18x42h VERY rich in person. These colors, though… HUGE hand embellished abstract framed in gold, $575. 74×49.5. Come grab this woven tray top folding table for just $95 25.5x18x31h. True lamp loveliness…$145 ea 33”h. Clockwise: 24″ wood & metal, $95. 36″ rattan, $175. 36″ green & gold, $165. Bottom left sold, sorry. We love these cabinets…2-tone in solid wood. $495 ea, 26x17x72″h. Create your own slice of cozy with this mantle. 79×7.5×54 Just $115. Perfect in it’s simplicity… solid wood coffee table $295. Such a handsome accent table—the base is wood and the top is galvanized metal. Retails for $435, our price $245. 30x16x32h. A great accent piece…large solid wood carved fish sculpture $145 31”w 30”h. For that wino in your life…black metal wine rack just $95. Holds up to 36 bottles, 15.25×11.25×44.5″h. Coffee, cookies, and wine. What more could you want while you’re Black Friday shopping? 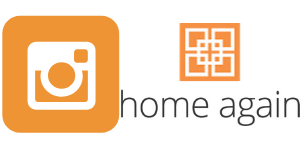 Hmmm…how about a SALE? 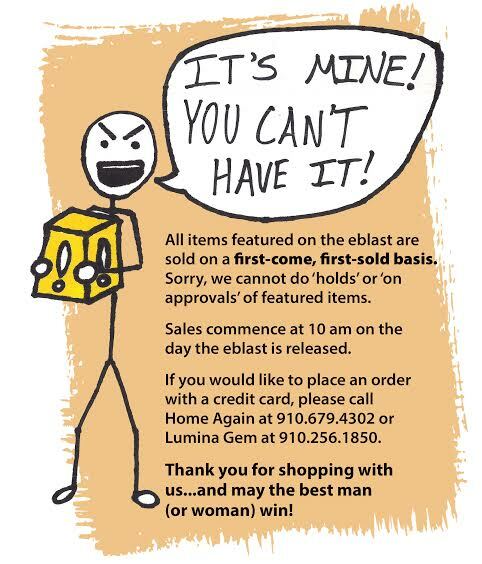 Many items are reduced for the holidays! Just in! 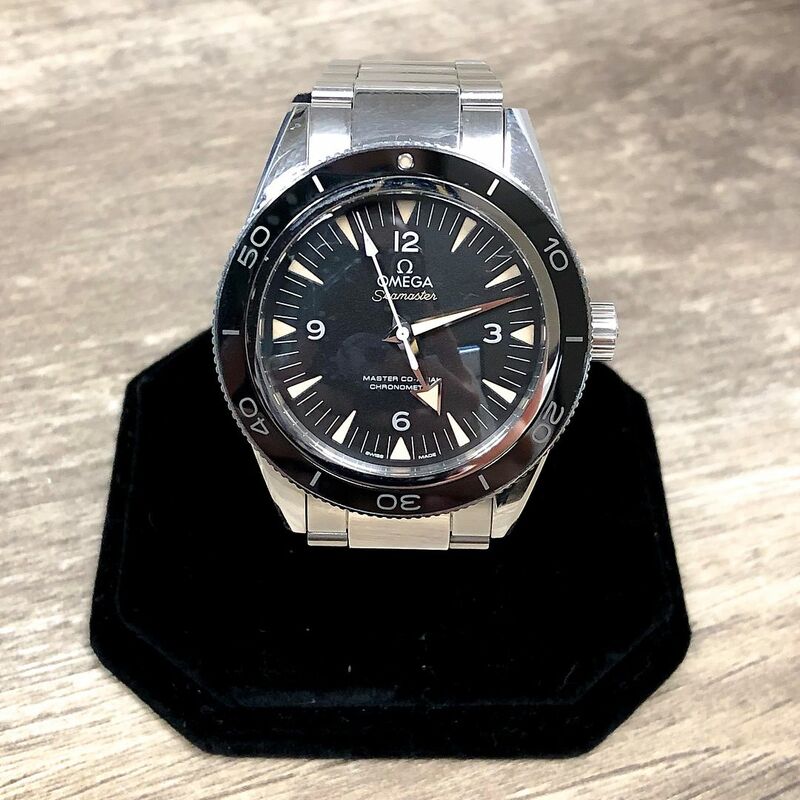 Omega Seamaster 300 Anti- magnetic stainless steel watch circa 2016, $4,295. 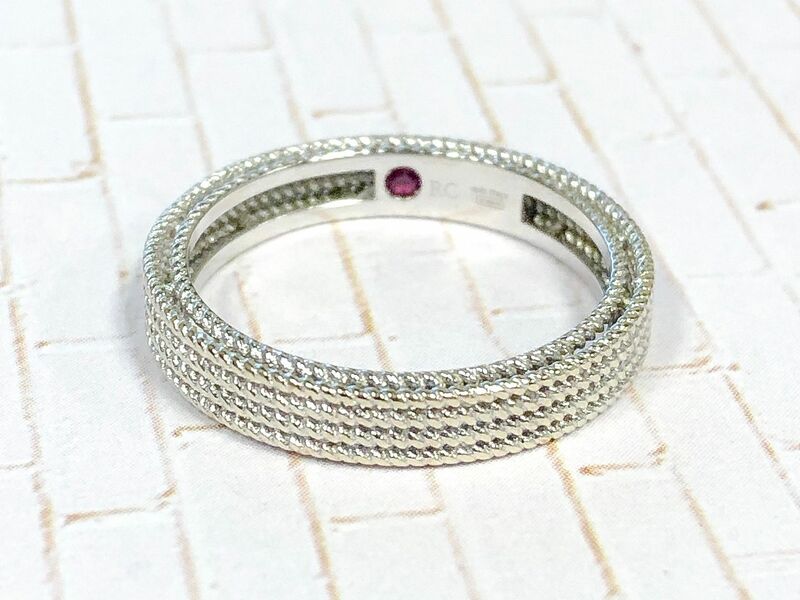 David Yurman 7mm sterling cable cuff with diamond end caps, $995. | David Yurman diamond 7mm cuff in sterling silver with 18k yellow gold accents, $1,265. Vahan pearl necklace on sterling silver with 14k yellow gold accents, $375. 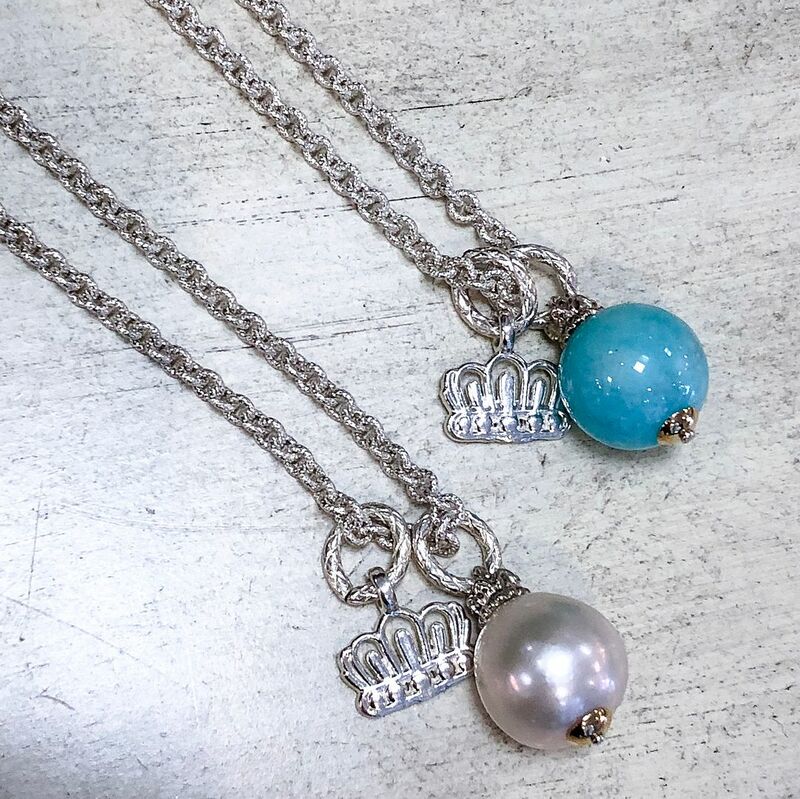 Vahan amazonite necklace on sterling silver with 14k yellow gold accents, $375. 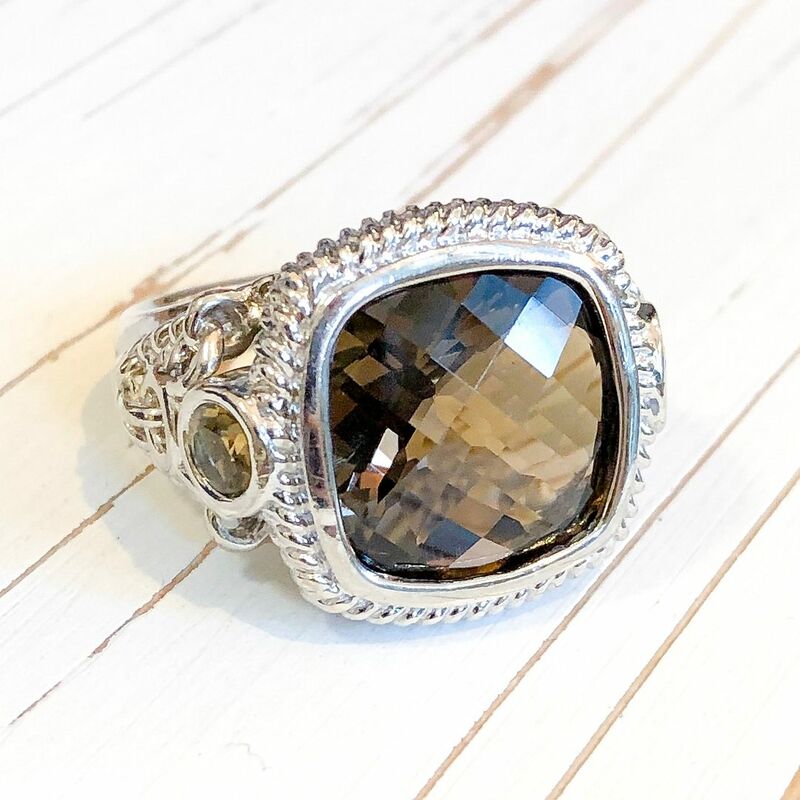 Anthony Nak smoky quartz and sterling silver ring, $250. 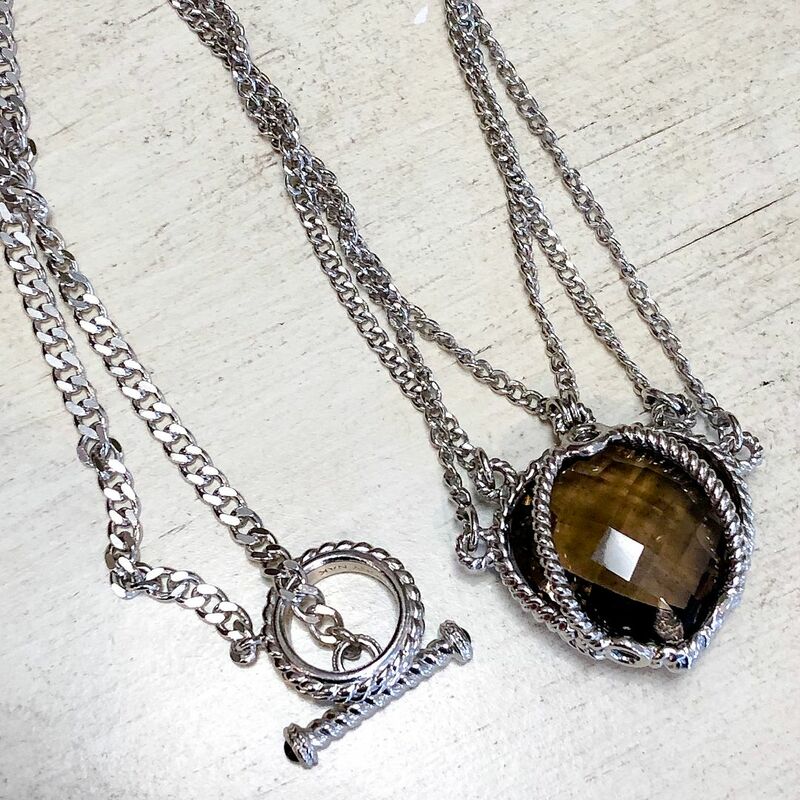 Anthony Nak smoky quartz and sterling silver necklace, $250. Roberto Coin Symphony collection 18kw gold barocco ring, $450. 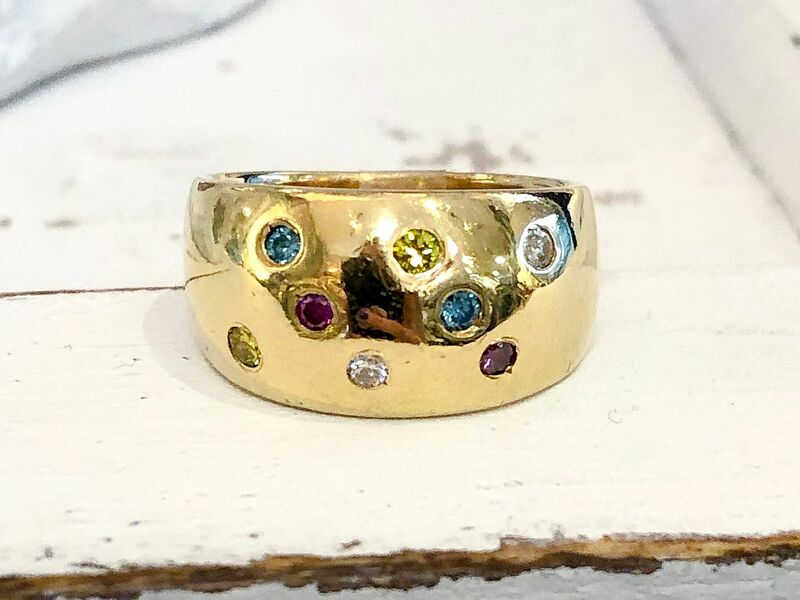 Wide gold domed band in 14k yellow gold with colored diamonds, $595. 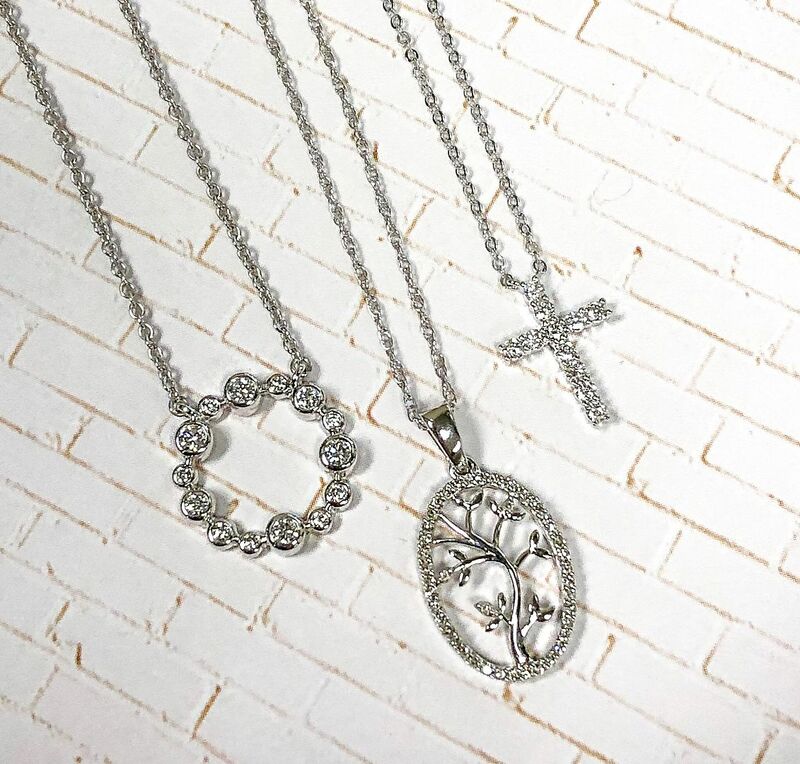 Stunning diamond necklaces starting at $215. 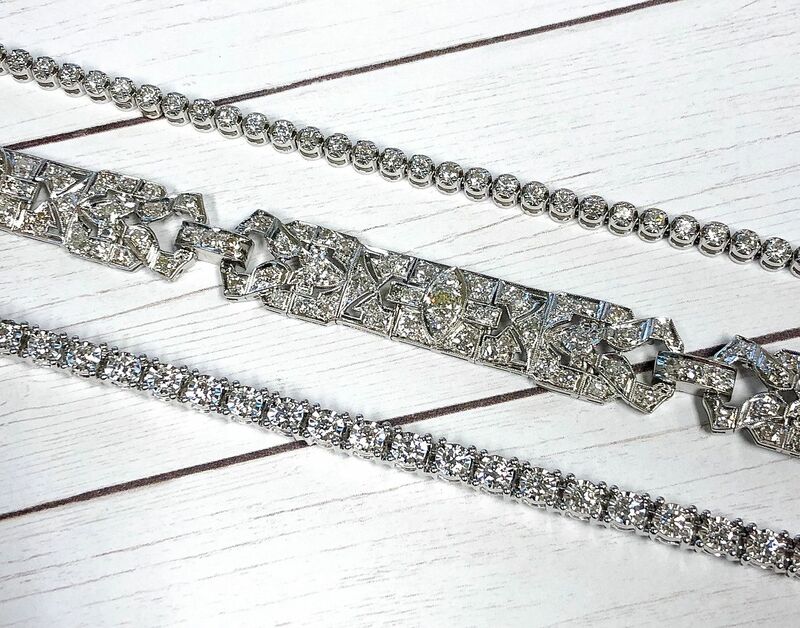 Diamond bracelets starting at $1,795. 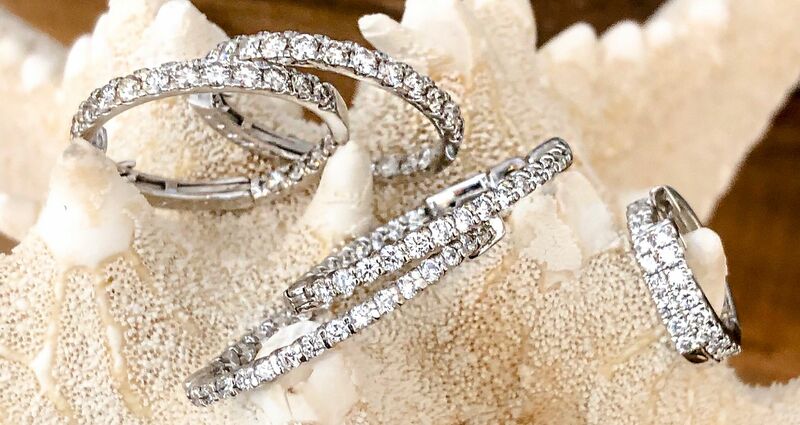 Diamond hoop earrings starting at $350. 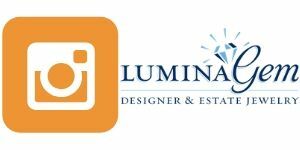 Everyone needs a pair of diamond studs! Prices starting at $295. 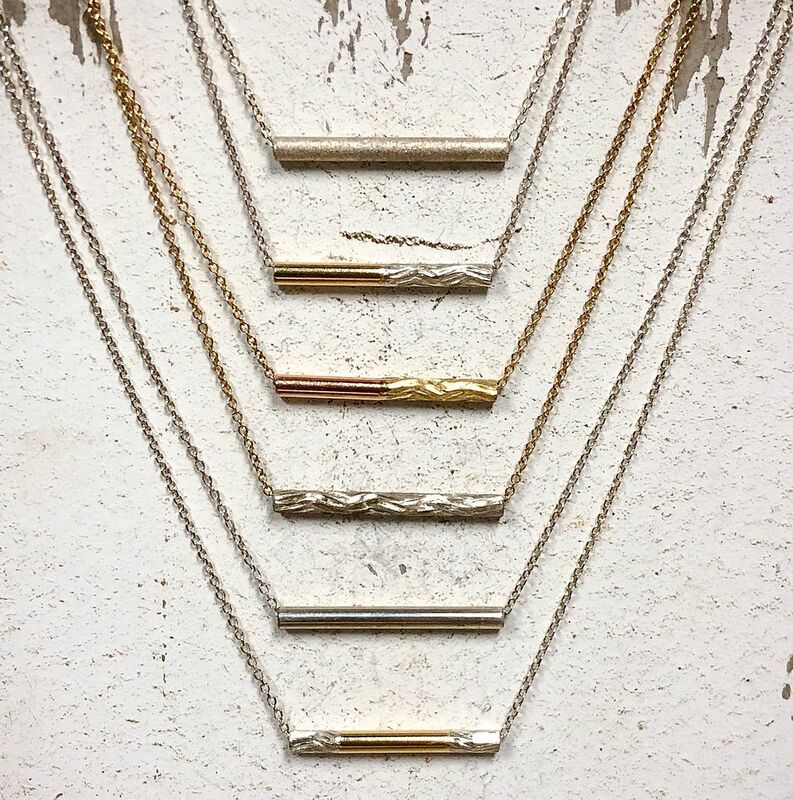 rEVOLVE, Lumina Gem’s own handmade line, starting at $65. 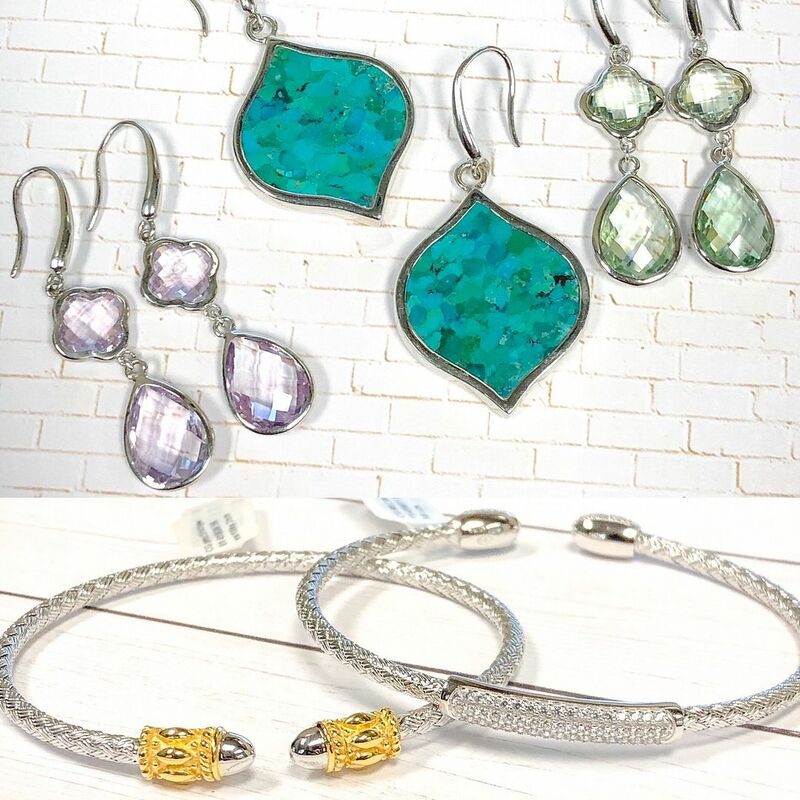 Charles Garnier Paris pieces starting at $55. 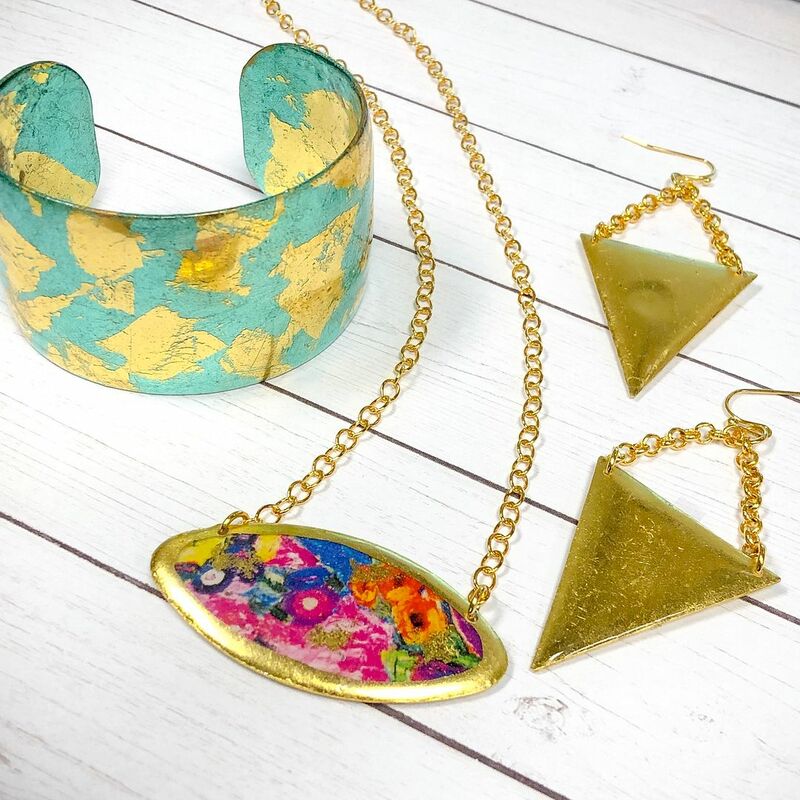 Unique and colorful Evocateur Jewelry pieces starting at $138. 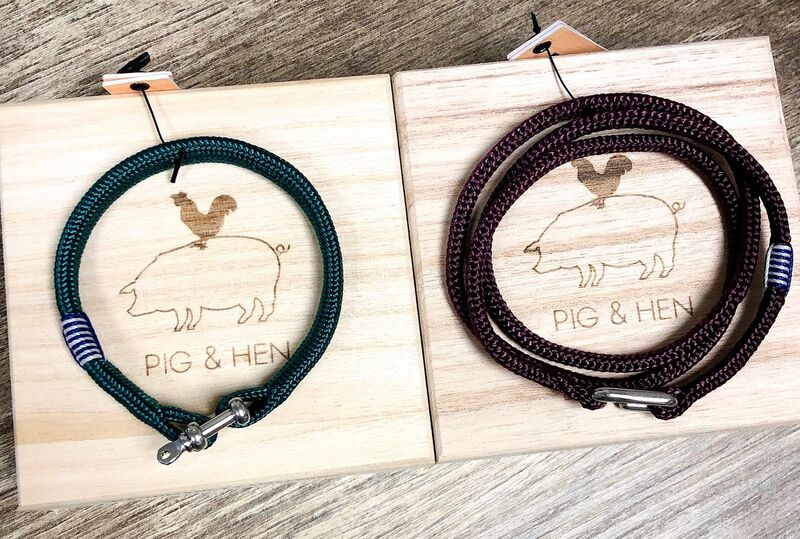 Tons of different Pig & Hen bracelets starting at $79. 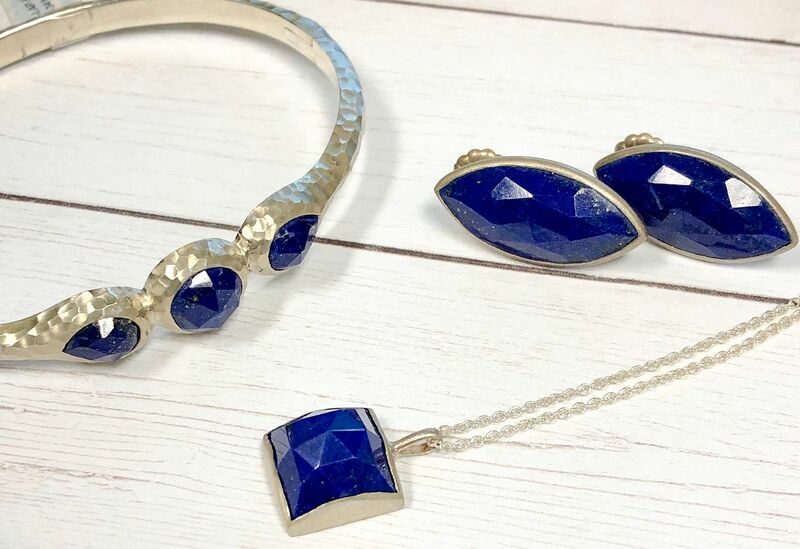 Nina Nguyen Jewelry starting at $146. 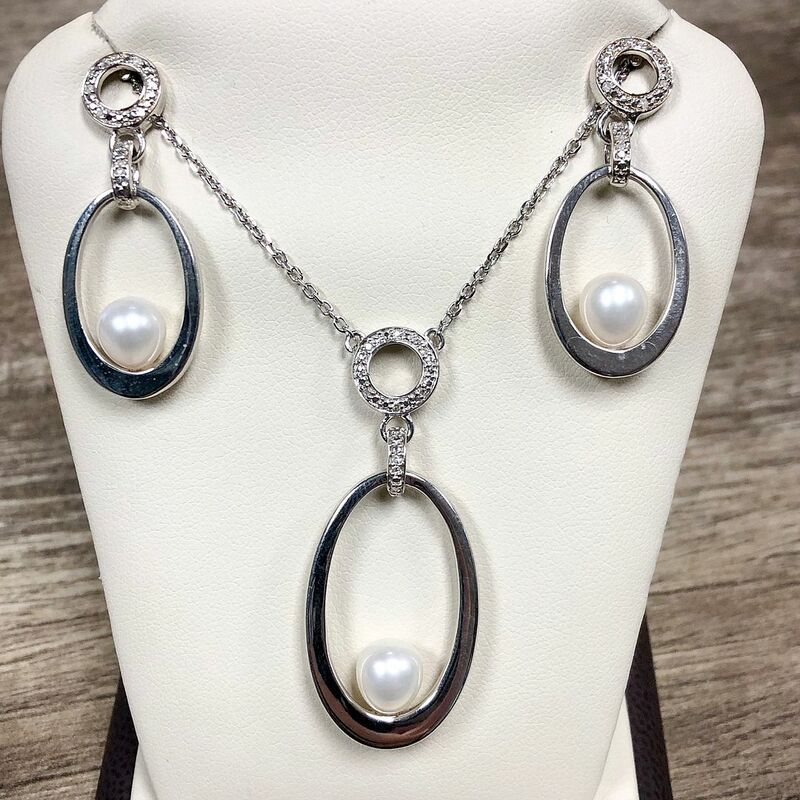 And tons more like these diamond and pearl necklace and earrings starting at $35. 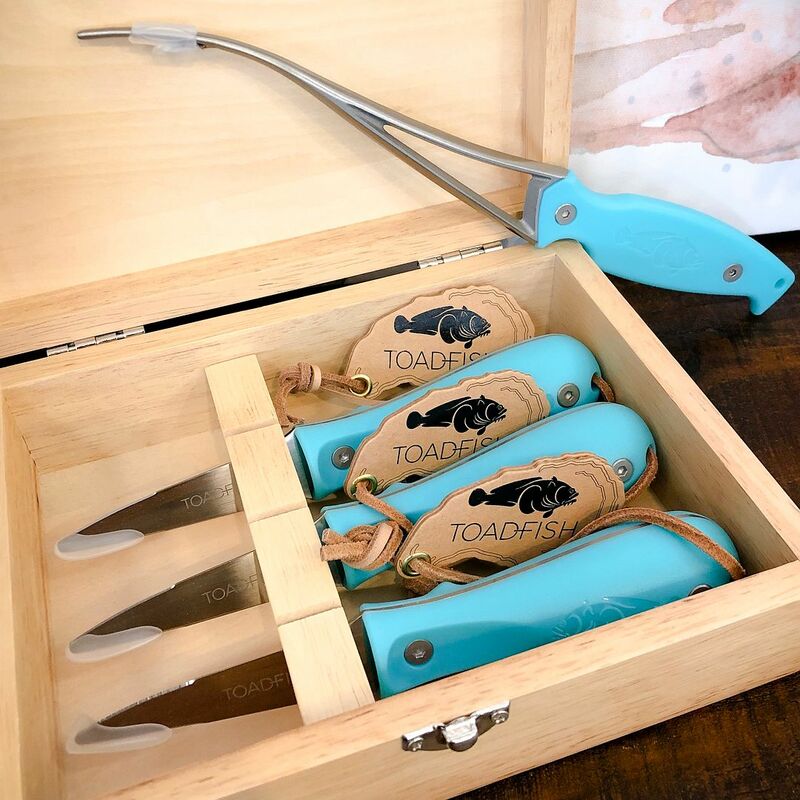 Toadfish oyster knives and shrimp cleaners, starting at $28. Looking for an alternative to the CHAOS? 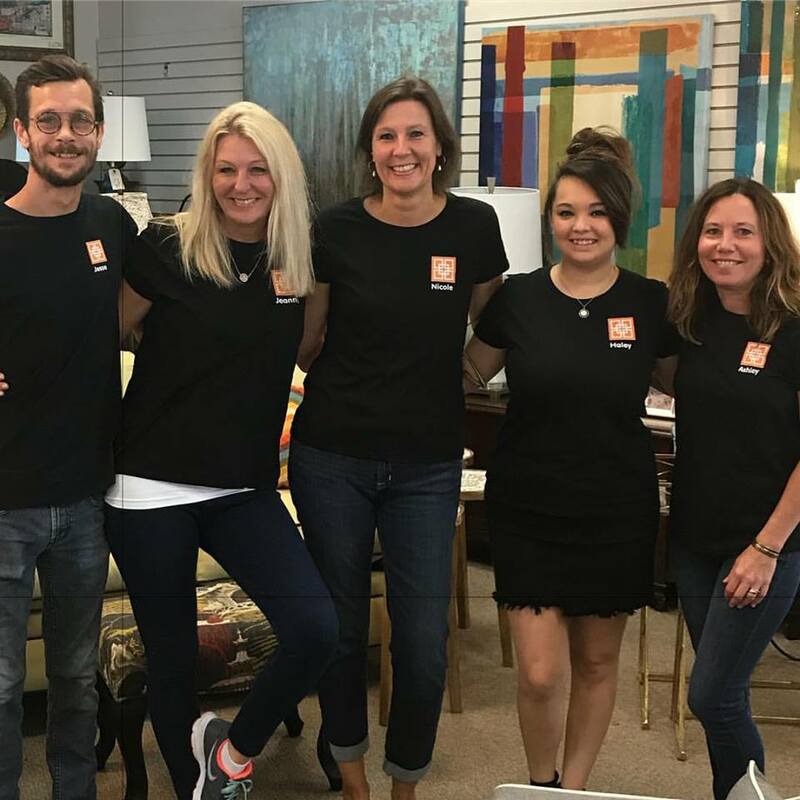 Come hang out and have some fun shopping with us!